If your air-conditioning unit doesn’t seem like it is cooling your house off as well as it used to, it could be because it is low on refrigerant. Inside every air conditioner, there is a special type of refrigerant that is used to create cool air. One of the most common types of refrigerants used in air conditioners is known as Freon. Even though people often refer to all refrigerant in air conditioners as Freon, it is important to note that Freon is actually a trademarked name for a specific type of refrigerant. There are other types of refrigerants used in air conditioners, as well. However, because Freon is so common, people often use that name to refer to any type of refrigerant. It is a little bit like how the name Velcro is used to describe any hook-and-loop fastener, regardless of whether the fastener is generic or is the actual Velcro brand. When the refrigerant level gets low, the air conditioner doesn’t cool the air as effectively as it should. As a result, you may notice warmer air than usual blowing out of your unit. In that case, you need to contact a repair company to come and recharge your unit, replacing the missing refrigerant. How Long Does Freon Last In A Central Air Conditioner? One common misconception that people have about the refrigerant in their air conditioner is that it is something that gets used up over time. They mistakenly believe that the Freon gets depleted as the unit operates – much like gasoline gets used up over time in a lawnmower, chainsaw, or another gas-powered machine. In fact, however, the Freon in your air-conditioning unit should last forever. Unlike gas, it doesn’t get used up. Instead, the Freon gets recycled over and over again without losing any in the process. At first, this idea can be a little bit hard to accept. After all, if the Freon was never depleted, air-conditioning units would never get low on refrigerant, right? In an ideal world, that would be true. In the real world, however, air-conditioning units often develop leaks. These leaks allow the Freon to escape from the unit, causing the levels to drop. The only reason an air-conditioning unit would be low on refrigerant is because it has developed a leak – not because the Freon has been used up over time. Freon really does last forever. There are some warning signs that you should watch for that may indicate that your refrigerant level is too low. The most obvious sign is if your air conditioner stops cooling as well as it used to. If it is blowing warm air, it could be a problem with the refrigerant level. Keep in mind, however, that there are other issues that can cause your air conditioner to stop cooling, as well. It is important to have the unit looked at by a qualified technician so that they can diagnose and repair the problem. Higher-than-normal energy bills could be another sign that your refrigerant is lower than it should be. When refrigerant levels drop, your air conditioner is forced to stay on longer to cool off your space. This uses more energy, which can result in a corresponding increase in your bill. Finally, you may start to notice ice forming on the outside of your unit. During the summer, you shouldn’t have any problems with your air conditioner icing up. If it does, you most likely need additional refrigerant. 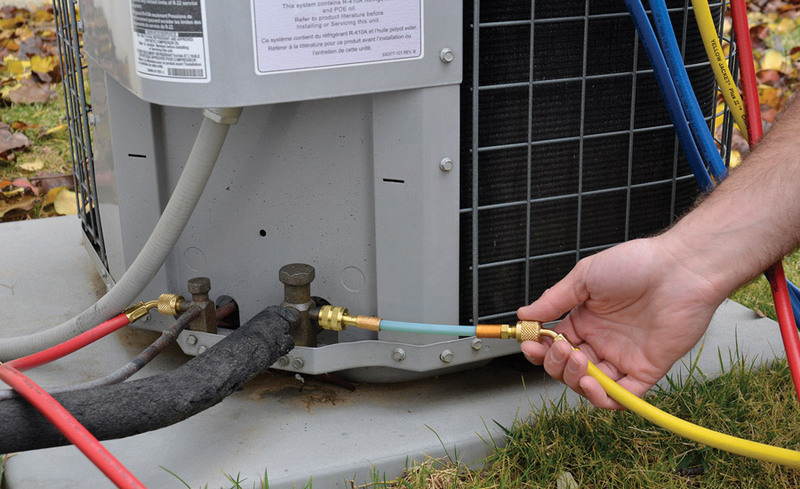 One of the biggest mistakes that homeowners make is paying to have their Freon or air conditioner refrigerant recharged without addressing potential leaks in their air-conditioning system. The only reason why your Freon levels would be low is because you have a leak. If a technician refills the Freon in the unit without fixing the leak, you will find yourself facing the exact same problem again in no time at all. It is a bit like trying to put air in a basketball when there is a hole in it. Even if you get the ball inflated, it will rapidly deflate again when the air leaks out of the hole. No matter how many times you fill it, it will keep going flat until the hole is fixed. The same is true for your air conditioner. There is no point in adding refrigerant until the leak has been corrected. Repairing a leak in an air conditioner can be quite expensive. It is important to talk to the technician about all of your options. Find out how much it will cost to fix the leak. Make sure that they include the price of replacing the missing Freon after the leak is repaired, as well. The quote that they give you should be for the total cost of getting your unit back in good working order again. Then, compare that figure to the cost of buying a new air conditioner. Depending on the severity of the leak and the cost of the refrigerant, it may be more cost-effective for you to replace the unit rather than repairing it. This is especially true if your air conditioner is old. Modern units are generally more energy efficient. As a result, you may be able to save money on your energy bills by upgrading to a newer unit rather than paying to repair your older unit. The important thing to remember is that Freon lasts forever. In a perfect world, you would never have to have a refrigerant replacement since it would keep getting recycled over and over again without any loss occurring. In reality, however, most air-conditioning units develop leaks at one point or another. If your refrigerant levels do drop, it is important to repair any leaks before refilling the unit. Otherwise, you are just throwing your money away. Depending on the age of your air conditioner, you may find that it is smarter from a financial perspective to replace your old air conditioner rather than repairing and refilling it. Ultimately, it depends on the age of the unit, the cost of the repairs, and the current cost of refrigerant. Talk to a qualified technician about which option is right for you.